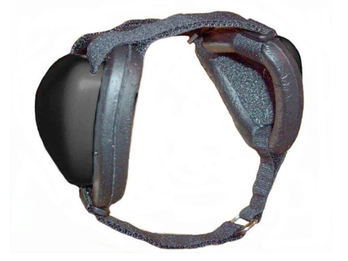 Mutt Muffs are unique noise protection ear muffs for dogs. Available in 5 sizes to fit most sizes of dog, Mutt Muffs make your pet much more comfortable in any noisy situation. The overall circumference measurement of your dog's noggin at the largest point is the best determination of size, because if you choose a size too large, the muffs won't seal well against his head, and you lose all the sound-reducing properties you were shooting for. Your dog's weight is also a good indicator of which size to choose. Using the handy chart, you can use your dog's weight and/or head circumference to determine the right size of mutt-muffs to fit your unique dog! Mutt Muffs DDR337A in Color! Mutt Muffs DDR337 Dog Ear Muffs (Black)2marleseAugust 1, 2017Sorry to say, did not work for our mutt. The ear muffs were a good suggestion but again not suitable for our situation. Thank you for your refund policy. Mutt Muffs DDR337 Dog Ear Muffs (Black)5Gus's Mom.July 23, 2017I have a rough collie that has supersonic hearing. For me, this piece of the puzzle was a great addition. It made the three days of over head fireworks so livable for everyone. I should have bought them 3 years ago when I found them. Mutt Muffs DDR337 Dog Ear Muffs (Black)1Linda HeckelSeptember 8, 2016They do not work at all I bought them so our dog would not hear the daily thunderstorms but he still quivers. Mutt Muffs DDR337 Dog Ear Muffs (Black)5Tommy thompsonNovember 12, 2015Labs were very nervous on the airboat. These muffs have made a big difference in their calmness on the airboat for the dogs. Mutt Muffs DDR337 Dog Ear Muffs (Black)5AliceJuly 21, 2013Finally my Australian Shepard can relax and sleep during fireworks and thunderstorms. Mutt Muffs are a success. Mutt Muffs DDR337 Dog Ear Muffs (Black)5KIMMay 21, 2012MY YORKIE WAS SCARED OF THE AIR BOAT. PUT THE MUTT MUFFS ON SHE NEVER TRIED TO TAKE THEM OFF, SHE STOPPED SHAKING. THANK YOU FOR THE MUTT MUFFS. EVERYBODY THINKS THEY ARE SO CUTE. Mutt Muffs DDR337 Dog Ear Muffs (Black)5Lynn GoochMay 5, 2012The muffs are great and my dog doesn't mind wearing them. They are a lot of money though. Mutt Muffs DDR337 Dog Ear Muffs (Black)5maryJanuary 24, 2012We live next to traffic. Chihuahua was happy to wear them and still getting adjusted. She falls asleep often with them on. No doubt she is finally getting a break from this noisy place. Perhaps a tiny bit lighter in weight for the little chihuahuas, but fit well. Thank you MM for thinking about the precious animals in creation. They hurt too in fact worse. Mutt Muffs DDR337 Dog Ear Muffs (Black)5DonnaJuly 11, 2011Lucy was not crazy about the muffs at first, but once she realized how quiet they made the fireworks, she actually fell asleep! Thanks for finding a way to help her through the 4th of July!